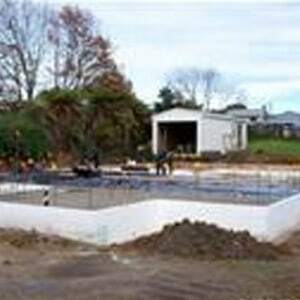 ECO-Block was asked to supply for a joint project between Housing NZ Corp and Beacon Pathways. The block was used to provide form work and exterior insulation to the concrete slab. The slab has no floor coverings and is designed to be solar passive with the sun heating it and releasing the energy at night. By using ECO-Block, the exterior of the slab was no longer exposed to the elements. If un-insulated it would not retain the heat as long and would also cool quickly in the winter.